I know I am an unbelievably lucky lady - my husband doesn't mind vacuuming. Of course you need to understand he is constantly in search of a better vacuum cleaner to make the job easier. In fact we need a special line in the annual budget for vacuum cleaners! (kidding). My in-house testing division has found a solution and when one discovers a design solution in this department we are honor bound to share it with the world. 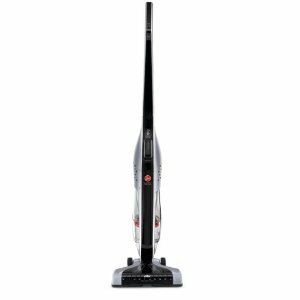 It is the Hoover battery powered Linx Cordless Stick Vacuum . It isn't for the heavy duty cleaning but for the everyday quick pick-up and there is no cord to drag around. It is powerful and does have brushes. David finds it runs for over twenty minutes on a battery charge which is plenty of time to clean up the daily wood stove mess, sloppycrumb piles and sand at the door. Remember we are still dealing with tons of snow outside and, although it has finally stopped falling, the ice is covered with sand and salt and a mess gets tracked in daily. There is an excellent price on this at Amazon and this link will get you there. Added Note: The hand held version failed the in-house testing standards. I have two of these and bought them a year apart, which shows how impressed I was! However, I am finding myself more and more frustrated by them because they constantly clog if I try to pick up a bit too much at one go or it encounters some odd-shaped thing that won't go 'round the two right angles in the path to the container.